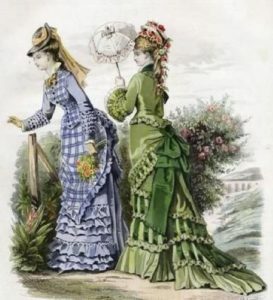 By 1877, The Bustle started to diminish in fashion. The Pads replaced the Bustle. The puffs in the skirt went behind the knees at the back. The gowns were tight fitting. The gowns were long and fitted tightly on the hips. The Horizontal look gave way to vertical lines. Tall and slim figures were fashionable and attractive. 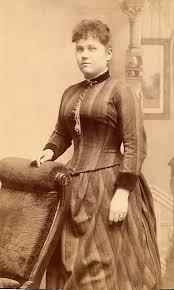 This was also the reason the entire gown was in one full-length cloth and no seam at the waist started doing the rounds. Skirts that were close to the legs known as tie backs were fashionable. The front legs were close to the skirts and were tied with strings. The back was left free in the form of a train which followed. This looked sensuous and the gown had a free-flowing look at the back. 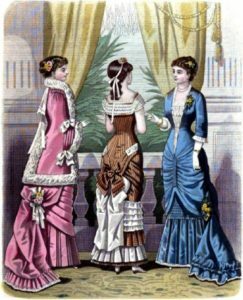 The Natural Form had lots of colors and textured imbued into each other in the form of skirts, drapes, bustle, frills, swags. The skirts were the main attraction and the bodice and upper part were comparatively simpler and tight fitting. Much of the drapes and layers were at the bottom of the skirts. The patchwork in the form of flowers and bows were used to hide the tucks. The bodice and upper attachments were on the shoulder. 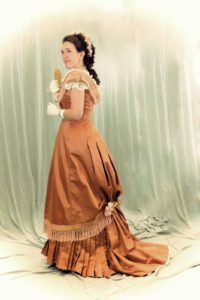 Strapless and off shoulders gowns were less common. The sleeves were either full size or small puffed sleeves which added to the whole straight look. The patch works and seams were hidden by using lace and flowers. Frills were also common. Flowers and Bows were used at the back and sides to hide the joints. Skirts became narrower and bodice longer. This gave the body a slim and tall look. 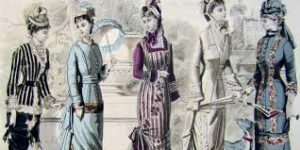 During the 1880s, a typical Bustle dress was called Cuirass. It was tight at the hip, had a long bodice and draped well. It was smooth and fitted excellently. These were worn in the evenings and during the dinner parties. Women chose to wear them during festivities. False curls became a rage, dust ruffles were put under the train, so that the long heavy backs didn’t become dirty. The skirts became narrow. The skirts fitted tightly at the hips. 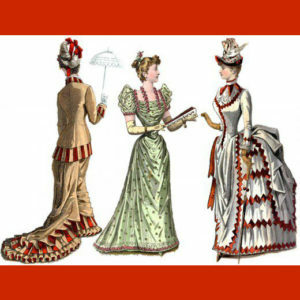 The Early Bustle large frills and layers of crinoline disappeared. It gave way to smaller Bustle with fullness extended at the back of the knee downwards. This was called the train. Cuirass bodice ended at a point in the front. 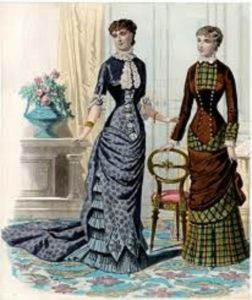 The Victorian Dress could be seen changing from Victorian Skirt to Victorian Bustle- now smaller bustle mainly at the train. Another outfit that became immensely popular was Princess Dress. 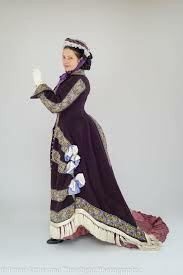 This also used Bustle but in the natural form, more at the back. The Bodice and the skirt were all stitched together without a seamed waist. The long lines from the shoulder line to the waist looked very pretty and elegant. This was because the waist was not differentiated. The entire bodice and skirt was one long piece, giving it the body a feline tall look. All said and done, the late 19th Century Victorian Natural Form and Bustle looked extremely dainty and fashionable. It made the body appear slimmer and taller. The reason it was primarily called The Natural Form was because it suited the natural figure of a woman and looked flowy and womanly.